Crow, left, discussses a community organized water pipe project at a protected spring in rural western Kenya. Crow and co-authors Brent Swallow, of the University of Alberta, Canada, and Isabella Asamba, from Kisumu, Kenya, found that women invest their freed-up time in income-generating activities such as raising seedlings for coffee and tea growers in the region or raising livestock. 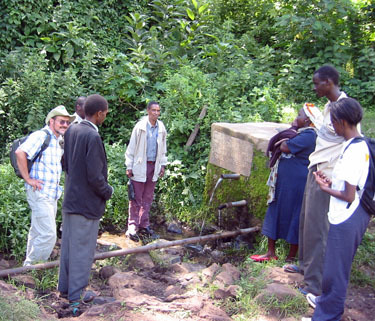 The authors' findings are the result of research into community-organized water projects begun in western Kenya more than seven years ago by UCSC Ph.D. student Jessica Roy who was struck and killed by a car while walking in Nairobi in 2004. At the time, Roy was one of his graduate students, said Crow, the current chair of UCSC's Sociology Department. The World Development article credits Roy with initiating the research and laying the groundwork for the methodology that Crow and his colleagues used. Community organization to build pipes from springs into rural homesteads, the paper suggests, leads to significant improvements in people's lives. Government and international development could support similar village water projects. Roughly 1 billion people worldwide lack access to safe drinking water. In rural Kenya, only 10 percent of the population has access to improved water supplies, according to the World Health Organization. 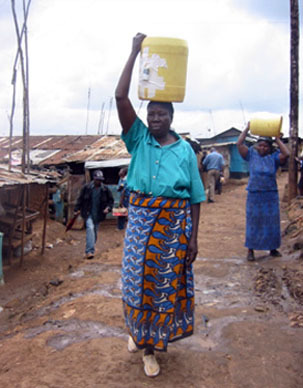 In a related study this past summer, Crow and UCSC computer science professor James Davis looked at water-collection activities in two urban slums in Kenya. They collaborated by affixing GPS devices to water cans women use to transport water. They then download the collected data and overlay it on maps to plot the distance, frequency, and time commitment involved. In the first study described in World Development, Crow and his co-authors found that whether a community undertakes a water project often depends on the nature of relations between men and women. Although women had more time to pursue other activities when water was piped to a village, men actually tended to have less free time because they were more likely to be involved in the community effort to improve water access. A typical community water project might take two to five years. "It's quite an undertaking," Crow said. The community must raise money, buy pipe and perhaps a storage tank. Then comes the effort to lay the pipe. Crow said women walk 200 to 1,000 meters several times a day to and from springs in the hilly area carrying jerry cans that weigh approximately 44 pounds when full of water. Ten trips might be needed on laundry day, four or five on other days. The effort can take up to four hours a day. Crow and the others surveyed seven communities with three types of water sources -- protected springs, unprotected springs, and piped water from protected springs. Protected springs have a concrete structure built over them with an outflow pipe or faucet that protects the water from animal or other contamination. They found that incomes generally rose after a community piped water to its homestead. "In three to five years we can see changes in income data," Crow said. The research was funded by grants from the U.S. Agency for International Development and the U.S. Department of Agriculture.